St. Nicholas was reportedly born in the city of Patara in Lycia in Asia Minor, heir to a wealthy family. He succeeded an uncle as bishop of Myra. Nicholas left behind a legend of secret acts of benevolence and miracles (in Greek, he is spoken of as “Nikolaos o Thaumaturgos” — Nicholas the Wonder-Worker). One of the saint’s prominent legends asserts that, in a time of famine, he foiled the crime of Fourth Century Sweeney Todd, an evil butcher who kidnapped and murdered three children, intending to market their remains as ham. St. Nicholas not only exposed the murder, but healed and resurrected the children intact. Nicholas is also renowned for providing dowries for each of three daughters of an impoverished nobleman,who would otherwise have been unable to marry and who were about to be forced to prostitute themselves to live. In order to spare the sensibilities of the family, Nicholas is said to have secretly thrown a purse of gold coins into their window on each of three consecutive nights. St. Nicholas’ covert acts of charity led to a custom of the giving of secret gifts concealed in shoes deliberately left out for their receipt on his feast day, and ultimately to the contemporary legend of Santa Claus leaving gifts in stockings on Christmas Eve. St. Nicholas evolved into one of the most popular saints in the Church’s calendar, serving as patron of sailors, merchants, archers, thieves, prostitutes, pawnbrokers, children, and students, Greeks, Belgians, Frenchmen, Romanians, Bulgarians, Georgians, Albanians, Russians, Macedonians, Slovakians, Serbians, and Montenegrins, and all residents of Aberdeen, Amsterdam, Barranquilla, Campen, Corfu, Freiburg, Liverpool, Lorraine, Moscow, and New Amsterdam (New York). His relics were stolen and removed to Bari to prevent capture by the Turks, and are alleged to exude a sweet-smelling oil down to the present day. In Austria, when St. Nicholas arrives with gifts for good children, he is accompanied by Krampus, a hairy, horned and cloven-hoofed monster equipped with enormous fangs who carries a bundle of birch twigs to beat up on naughty children. 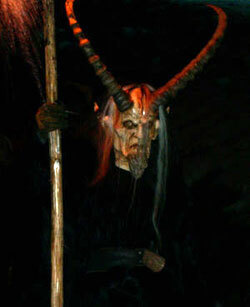 Krampus was banned by the fascists in the 1930s for being too negative a symbol. 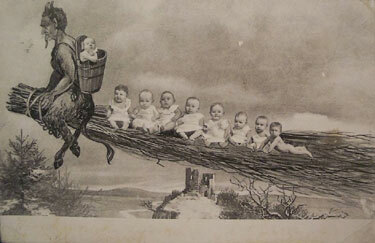 In the postcard above, a relatively benign version of Krampus is carrying unwary infants right away. the Archives of Never Yet Melted in the 'St. Nicholas' Category.